Need help? Find it here. If you don’t find what you’re looking for, please use our contact form and let us know how we can help. Create as many videos as you want, 3 or 300, we’re looking forward to it! Depending on your subscription plan, the download is available in Serial Digital (SD) or High Definition (HD). Further information here: Which video formats are available? Record your own voice or upload a pre-recorded voiceover. How to upload a professional voice-over? You want a simpleshow with blue scribbles? No problem! Depending on your subscription, you can color all scribbles in your video (except uploaded images by user). Emphasize individual scribbles with our effects. Choose between ticks or check marks, X, or asterisks. You can find more about this topic here: How to find the perfect visuals? Depending on your subscription, you can use and edit subtitles in your simpleshow. Standard subtitles are provided by your script which also relates to the visualizations on your canvas. Add subtitles to your video by choosing “show subtitles” in the Finalize stage. Your script appears as a subtitle-text on the bottom part of your canvas. Next to it you’ll find a pen symbol. Click it to adjust your subtitles or translate them to another language. Depending on your subscription plan, you can choose up to 6 different automated voices. Our storyline templates support your script writing by providing a structure, useful tips and two practical examples. You have full control over the privacy of your video. Our Explainer Engine analyzes your text and suggests matching scribbles. You can choose other scribbles, upload your own pictures or use our text tool to optimize your explainer video’s visuals. You can find more information here: How to find the perfect visuals? Depending on your subscription plan, you can remove the mysimpleshow watermark, the logo which appears in the upper right corner of your video. How exactly does this work? Find out here: What is a watermark? In the chapter menu, you can find previous versions of your script and also restore them. Find more information here: Can I go back to an earlier version of a video? Customize your closing frame with one of our templates. You can insert texts, upload images and edit our existing templates. How exactly does this work? Find out here: How to use closing frames? Browse our scribble database to find the best visuals for your video. With a business subscription you can use your video in marketing, customer communication or advertising. However, you can not assign or sell your rights to third parties. More information about commercial rights here: Can I use my video commercially? In our Pro-subscription plan, you can work as a team. Comment, transfer and edit projects with up to 3 team members! With a pro subscription you’re allowed to produce mysimpleshows and pass them on to your clients and customers commercially. You can permanently insert your logo into your simpleshows. It will appear in the upper right corner of your video and can be adjusted individually. You can find more information here: How can I add my own branding logo? Upload your own font and use it in your simpleshow. Manage uploaded images in your settings section. Share them with your team members, download or delete them. Edit subtitles depending on your subscription plan. Depending on your subscription plan, you can choose between 1-5 different music tracks. If you want to use your own music, just upload it in the Finalize stage. Do you want to show your video to other people? After finalizing your video, you’ll find a landing page. Send the public link to your friends, family and teachers so they can take a look at your video. After deleting your mysimpleshow account, the landing page for your videos will be deactivated shortly thereafter. What is a Storyline Template? A great script is fundamental for high-quality explainer videos. If no storyline meets your demands, you can also choose the blank template in every category. How do I use the PowerPoint import? It’s possible to use PowerPoint presentations as a basis for your explainer video script. 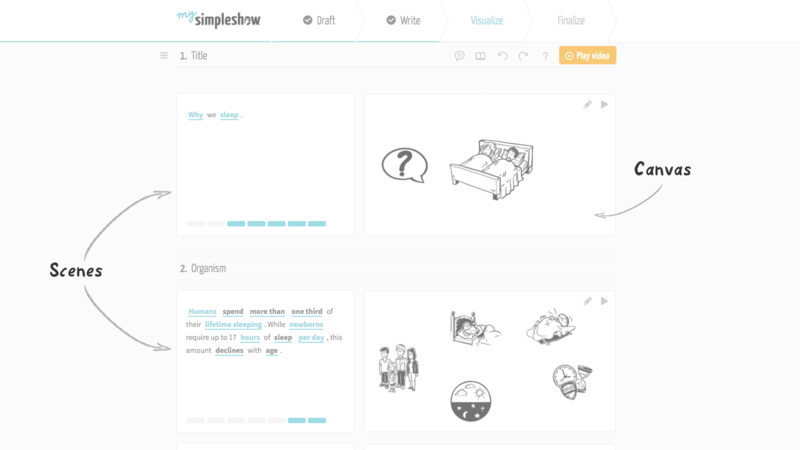 mysimpleshow analyzes your presentation and identifies relevant text content for your script. Your text will be automatically divided into several chapters. For orientation, you can always check your original slides on the right side . In case you exceed the limit of 2000 characters in total, you need to shorten your text. However, don’t worry, deleted chapters can easily be restored. Do I need to use a storyline? Yes, all mysimpleshow projects need a storyline. We’ve put lots of thoughts and experience into the creation of our storyline templates. They will guide you in writing a compelling storyline by giving advice and practical examples. If you’re not sure which storyline fits your topic best, have a look at some example videos. Can I make my video in multiple languages? mysimpleshow currently works in English and German. You can choose your video language at the beginning of the video creation process. In the write step, you can create your video in any language. However, the tool may not be able to identify all of your keywords, but you can choose your keywords and images manually. If you go this route, be sure to record your own voiceover or upload a professional voiceover. Depending on your mysimpleshow subscription, on-screen video subtitles can be edited in the Finalize phase. For example, if you create your initial video in English but quickly need a Spanish version, you can make a copy of the English video from your videos dashboard, go to the Finalize phase, and edit the subtitles so they show up in Spanish. It has never been easier to write your own script. The quality of your script is the key to a successful explainer video. At first, think about how to structure your video. The storyline template will guide you through the process. Which knowledge does your audience have? Is your topic difficult to understand? Do they know the technical terms and foreign words? Can your audience identify with the story? Is all information relevant to them? Make your audience understand the big picture first. Afterwards, you can add details much easier and more effectively. Avoid technical terms, terminology, and special short forms. The easier your audience can understand your text, the more successful your explainer video will be. – Will my audience understand the text while listening to it? – Is my text easy to pronounce? If your text it not easy, try to simplify it. Don’t use loanwords or difficult technical terms. Introduce a main character to your story. It will help your audience to identify with the topic and story. The character might have a problem or is stuck in a situation which could be solved. You can introduce a second character who is helping the first one or the other way round. That brings your script to life! What’s the essence of your story? Regardless the context of your explanation, you should always put your audience first. Use the 5 rules of explanation. How do I use the Write stage? In the Write stage, you create your video script which will later be read aloud by the audio voice over. Writing a script is the basis of your video, hence it is very important to devote special attention to this phase! On the left side, you will see the structure of your storyline. The guidance below each heading will explain how to split your text among the chapters. On the right side, we always support you with two practical examples, helping you getting inspired. Guidance: Which part of your story should appear in which chapter? Tutorial: Helps you in this stage. You can also leave chapters empty. If so, they will not appear in the final version of your simpleshow. You can also split a chapter up into several scenes later on in the Visualize stage. However, you cannot add new slides. We don’t want users to make simpleshows longer than 3-4 minutes. It is proven that concentration decreases after 3-4 minutes of watching a video. We understand this can be frustrating but try to focus on your most important messages! Why do I need to write a script first? A video can just be as good as the script it is based on. At mysimpleshow, your script is indispensable for visualization. We scan it for words and expressions that will appear as illustrations in your video and we also give you suggestions on how to visualize your key messages best. As the timing of all animations depends on your script as well, you see why it is such an import task. Here you can find some tips on how to write a great script. If you’d like to change the background color of your simpleshow, you can upload a pre-created background image on your first keyword, and then place all additional keyword images over the new background image. How do I add diversity? Although all of our images are black and white, the scribbles we provide include a diverse set of character illustrations. To search for a specific set of characteristics, enter what you are looking for into the search tool. You can also upload your own images or any image you own rights to if you’d like to include a more diverse character set! How do I use the Visualize stage? In the Visualize stage you create a storyboard for your video, based on the script you have written in the Write stage. On the left side, you’ll find your script split into scenes. After each scene, the canvas will be wiped clean. On the right side, you’ll find the canvas which gives you an idea of your final video. Here you can edit scribbles, upload pictures, or insert text. By clicking the “play video”-button in the navigation bar, you can watch a preview of your simpleshow with the current settings. Every scribble is related to a specific keyword. The keywords in your script which feature a scribble will be marked turquoise. How do I split and merge scenes? In the Visualize Stage you can split and merge scenes. Your script is divided into scenes, each one allowing you to use up to seven keywords (= seven scribbles). At the end of each scene, all scribbles get wiped off, so you can start over with a cleared white screen. To improve the structure of your explainer video, we recommend splitting some of your scenes, so they can breathe a bit more. Cut the scene by clicking and dragging the scissor icon, selecting a certain part of the text you want to split off. If you’re not happy with the result and want to reconnect the scenes, you can merge them by clicking the merge icon. Keywords are important words which are going to be visualized in your video. Every scribble is related to a certain keyword which will appear on the screen as soon as the voice over pronounces it. After you finish your script, the text you wrote will be analyzed. We identify keywords and offer you matching scribbles. The keywords of your script, featuring a scribble, will be marked turquoise in the text section. Other potential keywords that we found are marked black. How can I mark keywords? Every word in your script can be used as a keyword. Select your keyword in the text section by double clicking it (keyword may consist of multiple words) and clicking on the plus sign above. Another way is to drag a turquoise pill from the line and drop it on your new keyword. You can then choose a scribble, upload an image or type in some text. How can I deselect keywords? You can deselect keywords by clicking the X-sign above it. If you deselect a keyword, the corresponding scribble will be deleted from the canvas. You can select up to 7 keywords per scene. The amount of keywords you select can help you with improving the timing of your video. To create a good rhythm, try finding a balance between how much text is heard and how many actions are seen on the canvas. How to find the perfect visuals? After you finish writing your script, we’ll analyze your text and identify keywords to offer you matching scribbles. You can replace scribbles, upload your own images or use text in your explainer video. Every scribble is related to a specific keyword in your script. If the shown scribble doesn’t meet your demands, click on it and take a look at the four other choices we offer you. You can also browse our gallery to find more scribbles. If you’re looking for a completely different scribble, you can search for it manually in our scribble database. In order to find a different matching scribble, we recommend searching for synonyms. You can choose between a variety of characters of all ages to find your matching protagonists. mysimpleshow even enables you to use your own pictures via the upload menu. We recommend using .png-files. Please respect copyright law and only use images owned by yourself or that are licensed for third party usage. Instead of pictures, you can also use our text feature to visualize keywords on the screen, for example to show the title of your explainer video. You can use one of three effects on a scribble. We offer you a checkmark, an “X”-mark and twinkling stars. Clicking on the scribble launches the scribble picker. Click on “scribble effects” in the upper right corner and choose the effect you like. To delete a scribble, just move the cursor over the scribble or keyword and click the X-button appearing above. Is there a way to arrange my illustrations? Sure, you can arrange your illustrations. Open the ‘canvas edit’ by clicking on the edit icon in the upper right corner of a scene’s canvas. In the popup, you can arrange, scale and flip your illustrations. You can also add a polaroid frame to scribbles or add speech bubbles for text. For further information please read: How to find the perfect visuals? Can I use my own illustrations? Yes, when working on your storyboard in the Visualize stage you can upload any image file smaller than 7 MB. In order to achieve a more coherent video, consider adding a polaroid frame to your uploaded picture via the canvas edit feature. This will help maintaining a coherent video style. Why can I only use 7 illustrations per scene? The simple answer is: More than 7 illustrations usually worsens picture composition and the scribbles get too small to be recognized easily. If you feel the need for additional illustrations, consider splitting up your text into several scenes. Each new scene gives you 7 new illustration possibilities. How to use closing frames? Would you like to show your logo and contact information at the end of your simpleshow? Awesome, we’ll provide you with 3 different templates for that. You can edit these templates, save and share them with your team members. At the end of the Visualize stage, you’ll find our closing frames section. You can edit them by adding an image or text. Unfortunately, you can’t save your closing frame in Visualize stage, so please go to your account settings section to do so. In the settings section you can create and edit closing frames as well as share them with your team. To access this feature, please go to video settings. Choose a template and upload your image or text. Now you can save your closing frame. Afterwards, you’ll also find your closing frame as a template in the Visualize stage. You can also share closing frames with your team. If necessary, you can protect them from being edited by clicking the lock symbol. Why do my illustrations change, when I edit my text? Found a typo in your text? Did something change during your video processing? No problem, you can edit your text in the Visualize phase. If you change keywords, only the illustrations for corresponding scenes will change. Your new text will be analyzed and you’ll be provided with suitable scribble suggestions. All other scribbles remain the same. How do I change the color of one image? Depending on your subscription, you can change the color of all simpleshow scribbles in the Finalize stage. To change the color of one image, you can upload an image that you have rights to use. How do I use the Finalize stage? After writing your script and creating your storyboard, it’s time to finalize your video! You’ll find your workspace divided into two sections: Your scenes on the left, the voice over section on the right. You can now choose between our automatic voice-over, uploading a precast audio file or recording your own voice. If desired, you can add subtitles or adjust the tempo of your video. Add subtitles to your video by choosing “show subtitles”. Your script appears as a subtitle-text at the bottom part of your canvas. Next to it you’ll find a pen symbol. Click it to adjust your subtitles or translate them to another language. Upload your watermarks within the settings section. In finalize stage, you can decide whether to use them or not. Choose your favorite color and colorize the scribbles in your simpleshow. Please note: Images uploaded by the user won’t get colorized! In Finalize stage, you can record your own voice over using your computer’s microphone. We call it karaoke mode. Try it – it’s fun! Before you start recording, you should define a video playing speed. Start recording once you’ve decided on a tempo. Notice: The slower your video tempo, the more time you’ll have for recording phrases. You can add precast audio files to your video in the Finalize stage. To get your video and voice over in sync, we recommend following these three steps. Choose your preferred tempo and complete the clip with the automated voice Paul first. Download the video and record a voiceover for each scene. Select “Edit project” to return to your explainer video and upload your voice files in the Finalize step. This will overwrite the existing video with the self-made voice-over version. Can I use my own soundtrack? Yes, depending on your subscription, you can! If you want to use your own music, just upload it in Finalize stage. How can I add my own branding logo? With the Business subscription you can hide the mysimpleshow watermark in the Finalize stage. You are able to upload your own watermark in the Pro subscription. Take a look at this article: How do I use the Finalize stage? You know it from television: Many TV channels show their logos at the top left corner of the screen. You can do the same now: Your logo appears on the top right corner during your simpleshow. We call it a watermark. How can I use my own watermark? Go to video settings. There you’ll find the watermark section and be able to upload your logo. We recommend using an image file in .png format. As soon as you upload and saved your watermark, go to the Finalize stage and decide whether to use it or not. There are various ways to share your video! Once your video is rendered, you’ll see it on your video landing page. Underneath the video, there is a link provided so you can share it! Make sure the video status is set to “public” or “anyone with link” so it is viewable once you send it out. Connect your social media channels in your account settings to easily share to various social media sites. We also provide an embed code and a direct email option. Download your mp4 video in HD or SD to send it to your friends or upload it on your site. Is my video SCORM compliant? It is simple to export your video and import it into your LMS! Just export the video as an mp4 file in HD or SD and upload it into your LMS from there. I have finalized a video. How can I edit the project afterwards? You can always go back to editing your simpleshow. Just click the ‘edit project’ button on your dashboard, or on a project’s video page. Using the history feature, you can also take a look at older versions of your project. Also see here: Can I go back to an earlier version of my video? Can I go back to an earlier version of my video? we will overwrite the existing video with the new one. But you can restore older versions of your project in your history. Just click on the chapter menu and choose “Show history”. Get more information on this topic: I have finalized a video. How can I edit the project afterwards? Which video formats are available? After finalizing your simpleshow clip, you will be able to download it as a MP4-video-file. Can I use my video commercially? You want to show your explainer video in class or at a birthday party? – Awesome! As long as you don’t change the video after you download it, you’re free to use it for school or private purposes. To use your videos in a business context, you need to upgrade your subscription plan to Business or Pro. The Pro plan even enables you to pass your video on to third parties commercially. For detailed licensing information check our Terms & Conditions. How to connect my account to publishing channels? If you have a YouTube, Vimeo, or Wistia channel, you can connect it to your mysimpleshow account. This makes publishing your videos even more simple. Connect your account by clicking the “Connect” button below the channel you want to connect to. Follow the instructions to allow the publishing channel to access your mysimpleshow account. Create a YouTube account and click on “connect.” Google will ask you for permission to upload your videos with only one click from now on. How do I create a video with mysimpleshow? mysimpleshow provides you with a unique, new way of video making. We have taken all our experience of over 8 years in explainer video creation and developed an easy-to-use video maker that guides you through a simple process. The most important lesson learned: ‘a great video needs a great script’. Easier said than done, huh. Don’t worry, we do our best to support you when you write your script. You can choose from a variety of Storyline templates that we created for various topics. These storylines give your video structure and provide you with easy-to-follow guidance and examples. Afterwards, our Explainer Engine will suggest illustrations from our database to visualize your story, it creates a storyboard, and with just a few clicks your video is finished. mysimpleshow is the only video making tool, that will not bother you with timelines, keyframes or endless animation timing – we do all of this auto-magically. If you have a restricted Google Mail account and are not able to get emails from outside your network: please use your Google account or Facebook account. The best way for students to sign up to mysimpleshow with Google Chromebooks is the Google Sign Up on the mysimpleshow homepage. Click on “Sign up” and then “Sign up with Google.” After Google has connected with mysimpleshow, please click on “Sign in”. Using this sign up method, students can start their projects easily and don’t have to activate their accounts via email. Where did my tutorials go? Visit your ‘settings page‘ to switch the tutorials ON or OFF in our editor. You can always open them manually in the editor by clicking the ‘question mark’ in your toolbar. If you want to opt-out of specific tutorials, just check the “don’t show again” box. Click your avatar in the upper right corner and choose “My Settings” from the drop down menu. Here you can change your username, email address and password. Click ‘Forgot your password?’ in the login window. Check your email inbox or spam folder as required. Log into mysimpleshow with your email address and the new password provided. Pick a new password in your account settings. You can delete your account in your settings menu. We will permanently remove your personal data and all of your projects. We are sorry to see you leave. What can we do to improve mysimpleshow in the future? Your honest feedback is more than welcome. How do I sign up for mysimpleshow? Please choose a subscription model and payment method. Enter your first and last name, e-mail address and password. Also check the box below to accept our general terms and conditions before you can sign up. After that, we’ll send you an activation link via e-mail. As soon as you activate your account, you can start creating your first explainer video. Enter your first and last name, e-mail address and password. Also check the box below to accept our terms and conditions before you can sign up. Think of a name for your team and choose a payment rate, either monthly or yearly. Subsequently, fill in your company’s and the account holder’s information. VAT will be added automatically. Finally, checkout via credit card or Paypal. We accept Visa, MasterCard, and Amex. Fill in your credit card number, expiration date and the 3-digit CVC number on the back of your card. Check your information carefully and complete your order. We’ll send an activation link via e-mail. Go to your inbox and activate your mysimpleshow account by clicking the link. Start your first explanation video now! You can change your personal settings by choosing “Settings” in your avatar’s drop down menu, located in the upper right corner. Change any of your personal settings by clicking the pen symbol. mysimpleshow is available in English and German. You can select your preferred language for the mysimpleshow homepage and your video projects separately. If you want to write a German script for example, use German as your project language, so our script template and explainer engine will also switch to German. Don’t worry: You can reselect your project language for every new video you’ll create! Get mysimpleshow’s hottest news directly to your inbox by subscribing to our newsletter! If you want to get notified as soon as a team member comments on your project, make sure to enable this feature in your notification settings. You can use a default profile pictures or upload your own. Downgrade your subscription by switching to a free subscription plan. This can be done by manually by switching your subscription to “free” or by clicking the respective button at the bottom of your settings page. After downgrading, your subscription will expire at the end of the respective contract period (year or month). In case you’re not changing your subscription plan to “free” within the paid contract period, the contract is automatically extended by an additional year or month (depending on the payment rate you chose for the previous subscription). If you switch to higher-priced subscription plans during your contract period, the existing subscription will automatically be terminated. In case you already paid for an older subscription plan which you then cannot use anymore, we will refund the remaining amount. For detailed information, please visit our Terms & Conditions. No results found. Please change your search terms or contact us.